The Teardrop Ball has been one of our most highlighted and successful events to date. Hosting up to four hundred guests in venues such as The Macron Stadium and Lancashire County Cricket Club enabled the Charity’s profile to be raised whilst guests enjoyed a fabulous evening. We have been fortunate enough to have had Lemar and The Overtones headline at two of these events and we also had the pleasure of achieving ‘Best Evening Entertainment’ in 2012 in the ‘What’s on for me Awards’. The Spring Flower Dance is by far our most popular, attractive and fun-filled FUNdraiser. This event is always a sell out and grows with popularity each time we are privileged to be hosts. 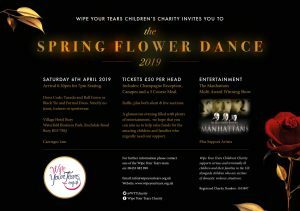 All guests are guaranteed a memorable and entertaining evening inclusive of a Red Carpet and champagne reception along with a 3 course sit down meal, raffle, auctions both silent and live and many more surprises along the way. 2019 sees a change of venue to The Village Hotel, Bury which includes full use of spa facilities, The Verve Pub and fantastic surroundings including overnight accommodation for all of our attending guests.